Zone 2 Tube and London Overground station on the District, Hammersmith & City, and East London lines. 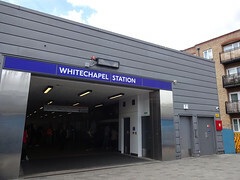 Note: As of January 2016 the main entrance on Whitechapel Road photo has been closed, and a new temporary entrance has been opened on Court Street (pictured). Accessibility: Steps everywhere at the moment, though this will be rectified as part of the ongoing Crossrail works. Interchange between the District/H&C lines and the East London Line involves a set of steps with a landing in the middle. Exit and entry to the station is via the westbound District/H&C platform, and involves one more flight of steps with a landing in the middle inside the station, and another short flight outside the station. All have sturdy handrails. Last edited 2016-07-29 18:06:06 (version 25; diff). List all versions. Page last edited 2016-07-29 18:06:06 (version 25).